If you were in a rollover accident you know it feels like the world has been turned upside down again and again. Depending on how many times you flipped over after your Miami car accident, you may have wondered whether the car would ever stop. In these car accidents, the body jerks around and slams against multiple parts of the interior of the car. While the car collides with the ground over and over, your body does the same with the inside of the car. The Miami car accident lawyers at Wolfson Law Firm’s experience in handling rollover accidents might just be what you need on your case. Other factors contributing to rollover car accidents include alcohol use and speed. In most rollover accidents, the car was traveling at speeds exceeding 55 miles per hour. Driver distraction can also lead to rollover accidents during routine driving maneuvers. Sadly, rollover car accidents result in sometimes serious injuries or fatalities requiring intensive medical care, years of rehabilitation, or missed time at work. Families may be overwhelmed by bills and medical care for loved ones following these accidents; victims may suffer immense pain and suffering. Fortunately, the law offers important protections to car accident victims. Miami rollover car accident lawyers may be able to seek compensation for their personal injury clients’ injuries, lost wages, and pain and suffering. The Wolfson Law Firm offers assistance to rollover car accident victims in Miami, Florida. If you’ve been injured in a rollover accident, or know someone who has suffered injuries or death as a result of such an accident, our rollover accident lawyers in Miami can review the details of your case and help you file a personal injury lawsuit, if necessary. Why do cars roll? Many drivers aren’t aware of the physics that underlie car accident rollovers and therefore may not be aware of the best ways to prevent these car accidents. Furthermore, passengers who have suffered injuries as a result of a car rollover may not understand that negligence on the part of the driver can easily result in a rollover. 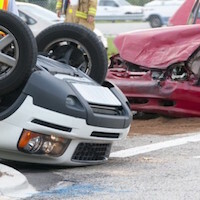 Because these accidents sometimes happen quickly, it is important for victims and loved ones to be aware of the common causes of car rollovers. The National Highway Traffic Safety Administration, in its studies of the causes of rollover accidents, found that 95% of rollover accidents occur because a car left the roadway. Distracted driving, alcohol use, and fatigue can all result in drivers drifting off the road. All it takes is a few seconds of distraction or tiredness for a car to drift. When the car’s tires hit a softer surface—like gravel, or when the car hits a guard rail, the high speeds and forces can result in a car tipping over. If a car hits a guard rail, the car can sometimes ride up the rail like a ski jump. The car hits the “ramp” of the rail at such high speeds that the car is tossed upward and into the air. Off-road driving can also lead to rollovers. For instance, if an SUV loses control while moving downhill and the driver attempts to correct for the loss of control, the high center of gravity of the car can cause the SUV to rollover. Additionally, if a car is located on a steep slope, the car can also tip over. Other, less common rollover car accidents occur when drivers are moving at high speeds, or when cars carrying heavy weights attempt to avoid obstacles on the road. Overloaded cars are more likely to tip over during sudden corrective driving maneuvers. The fast turn combined with the center of gravity of a heavily loaded car can result in a rollover car accident. While the physics involved in a rollover vary with each situation, the result is sometimes serious and devastating for victims. If you’ve suffered an injury in a rollover car accident as a passenger or due to another driver’s negligence in Miami, Florida, the Miami rollover accident injury lawyers at the Wolfson Law Firm, L.L.P. are here to help. Our Miami Serious Injury Attorneys help victims seek justice for their pain and suffering through aggressive representation, litigation, and trial skills. In order to file a rollover car accident injury claim in Miami, Florida, your Miami car accident lawyer will first determine liability. Who was driving? Were you a passenger? Were other cars involved? If your injuries were the result of a driver’s negligence, our Miami rollover car accident lawyers will help you file a rollover accident injury claim. We will take the time to review any medical reports, police reports, and interview witnesses, if necessary, to help build the strongest case possible. Every personal injury case is unique. Some settlements can be arranged outside of court without litigation and some will require litigation and trial. The Miami Car Accident Attorneys at the Wolfson Law Firm will assist you every step of the way. Contact our firm today to discuss your options and your rights with regards to your Miami rollover car accident injury claim. At Wolfson Law Firm, our Miami Rollover Accident Injury Lawyers can help you pursue justice and compensation from any responsible person, driver, manufacturer or corporation that may be responsible for your rollover car accident injury. Call us at 305-285-1115 to set up a free consultation with one of our Rollover Personal Injury Lawyers today. The Wolfson Law Firm in Miami has proudly represented personal injury clients and the families of wrongful death victims for over 60 years. Jonah Wolfson is a bilingual personal injury attorney in Miami and is ready to speak to you right now. Please feel free to check our recent cases, results and our qualifications. The Wolfson Law Firm also represents personal injury victims in Miami Beach, West Flagler, Hallandale, Flagami, Weston, Fontainebleau, South Miami, FIU, Miami International Airport (MIA), Miami Shores, Little Havana, Dania Beach, Allapattah, Kendale Lakes, The Roads, Wynwood, Florida City, Brickell, Hammocks, Westchester, The Falls, Hollywood, Miami Gardens and other cities throughout South Florida.